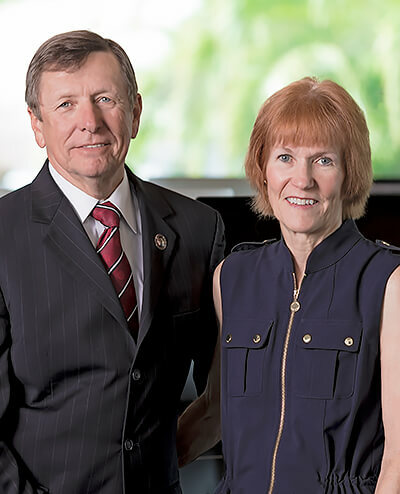 T. Dwayne and Mary Helen McCay, the first scientist couple nominated to the Florida Inventors Hall of Fame, hold 15 joint U.S. patents in the area of metallurgical engineering, specific to laser-induced surface improvement (LISI) that has greatly contributed to increased patient safety and improved medical outcomes in facilities nationwide. Dwayne McCay is the current president and CEO of the Florida Institute of Technology (FIT) in Melbourne. Prior to coming to FIT in 2003, he held leadership positions at the University of Tennessee Space Institute, NASA Marshall Space Flight Center, and Air Force Rocket Propulsion Laboratory. Mary Helen McCay is a native Floridian, FSU and UF alumnus, former NASA Payload Specialist Astronaut, and director of the National Center for Hydrogen Research at FIT. Both highly regarded academics, the McCays’ life-long commitment to education, the ideals of invention, and the advancement of science has greatly impacted the aerospace industry and advanced STEM education in central Florida.